Well you’ll never guess what I got in this week's CSA box—radishes. I wasn’t surprised really, just sort of resigned. Then I saw a giant head of cabbage and started to feel better. At least I had all the fixins’ for some more coleslaw. On the way home I started feeling a little guilty about all my anger-feelings toward those little radishes and thought I should try to make it up to them somehow. So here it is: their 2 minutes of fame, a moment in the spotlight. Behold the glory of the watermelon radish. 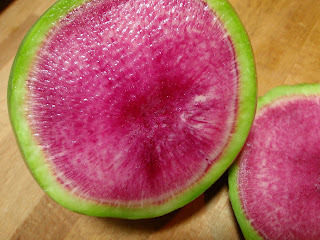 The watermelon radish is an heirloom variety of the daikon family, and gets its name for obvious reasons. Supposedly it's coloring intensifies with the addition of a little vinegar, which might come in handy the next time you're throwing together a veggie tray and want to impress your friends. It’s a root vegetable related to the horseradish and turnip family, and it’s intensity decreases as it matures, so get around to eating them sooner than later. And if you’re looking for something extra special to do with your radish supply, check out what the mixologists at Felicia’s Atomic Lounge have come up with in NY. A radish cocktail? Yep, they did it. So there you have it, I said 2 minutes, not 15. Don’t look so disappointed. 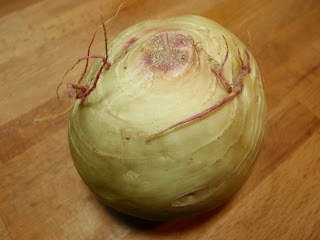 The Japanese word daikon literally means “large root." hey! just noticed you're a follower on my blog. wanted to say hey!